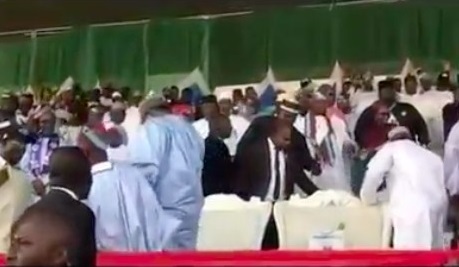 Nigeria's President, Muhammadu Buhari narrowly escaped an embarrassing scenario after he almost fell while trying to take a seat at the just concluded All Progressives Congress rally in Kaduna. It will be recalled that the President also missed a step and almost fell during a campaign rally in Kogi state a few days earlier. This has raised a lot of concern among Nigerians who are worried about the true status of his health. NairaNaijaNews has been furnished with the footage.